PHI’s patented TRIFT mass spectrometer with Parallel Imaging MS/MS provides superior sensitivity, low spectral background, unique ability to image highly topographic surfaces, high mass accuracy and mass resolution, and unambiguous high mass peaks identification with parallel tandem MS imaging capability. The nanoTOF II can be configured with a wide variety of options to optimize performance for organic materials, inorganic materials, or both, depending on customer requirements. Integrated Parallel Imaging MS/MS for fragmentation and analysis in a separate TOF analyzer providing unambiguous peak identification and parallel tandem MS imaging capability. Due to the limitations of TOF-SIMS in mass accuracy and mass resolution, high mass peaks often go unidentified in traditional TOF-SIMS experiments. PHI’s revolutionary Parallel Imaging MS/MS eliminates this limitation. In the MS/MS mode, a precursor ion of choice (1 Dalton wide nanoisotopic acceptance window) is selected from the secondary ion stream and deflected into a high energy collision induced dissociation (CID) cell while the rest of the secondary ions are collected as usual (MS1 data). In the CID cell, the precursor ions collide with argon gas causing fragmentation. The resulting fragment ions are mass separated in a linear TOF and counted at a second pulse counting detector, producing an MS/MS spectrum (MS2). Similar to the MS1 data, a full spectrum is collected for each image pixel in the MS/MS experiment. Thus, the MS/MS tand traditional TOF-SIMS data are collected simultaneously from the same analytical area in a single experiment. The imaging speed of both MS1 and MS2 data is based on a pulsed ion beam operated at >8 kHz. The resulting MS/MS fragmentation spectrum is used to positively identify the composition of the precursor ion by identification of the fragmented ions and/or comparison to mass spectral databases. Operating the TOF-SIMS in the MS/MS mode can also improve the sensitivity for species in which the peak of interest has mass interferences with other compounds. By detection of a unique fragment ion originating from the species of interest, the limit of detection can be greatly improved. Parallel imaging of MS1 and MS2 peaks from a sample of heat treated PET, showing that identical areas are analyzed at the two detectors and that the precursor molecule at +m/z 577 (ethylene terephthalate trimer) is localized to the crystals. Line scans show <200 nm spatial resolution for both modes of imaging. MS1 and MS2 data are collected in parallel at 8 kHz in less than 15 minutes. Automotive polymer sample. MS/MS image (MS2) of the +m/z 481 precursor ion showing a non-uniform distribution of the species on the sample surface. MS/MS spectrum (MS2) obtained from CID fragmentation of the +m/z 481 precursor ion. Identification of the fragment ions indicates that the precursor ion [M+H]+ is Tinuvin 770, a polymer additive. Further confirmation of the identity of the precursor ion is made with a positive match to Tinuvin 770 in a commercially available MS/MS database which is included with tandem MS/MS. The spectrum in red is the MS2 spectrum and the blue spectrum is the acquired reference database spectrum of Tinuvin. HR² imaging is demonstrated below in the images of micro-organic droplets. In a single analysis, peaks for multiple molecular fragments were observed in the spectrum at m/z 57 with high mass resolution and identified by measurement of their exact mass. The distribution of each species was visualized with a spatial resolution of less than 400 nm. The single measurement that contains all this information was acquired in only six minutes due to the high ion beam current available in the nanoTOF’s HR² imaging mode. 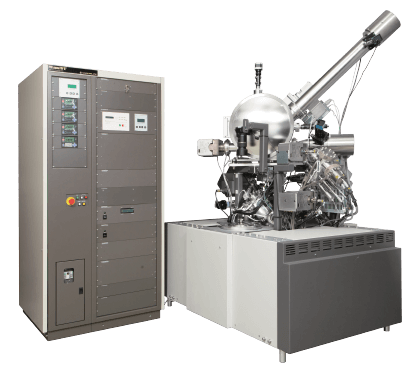 20 kV Ar2500+ gas cluster ion beam for molecular depth profiling organic films. Shown in Fig. A is a depth profile of a multi-layer polystyrene and poly (2-vinylpyridine) block copolymer film obtained by sputtering with a 5 kV Ar2500+ gas cluster ion beam. 20 kV C60 ion gun provides imaging and spectroscopy when the highest sensitivity for organic species is required. Shown in Fig. B is the detection and imaging of specific lipids in a mouse brain specimen. 3D FIB-TOF images of a solid oxide fuel cell with a 50 x 50 x 10 µm analysis volume show the ability to observe compositional information and physical structures such as voids.